The new year is bringing new episodes to UP. Recently, the network announced new seasons of Bringing Up Bates and Growing Up McGhee will debut in January. Growing Up McGhee follows Mia McGhee and Rozonno McGhee and their young family of sextuplets. Meanwhile, Bringing Up Bates chronicles the lives of Gil and Kelly Jo Bates and their 19 children. Season five of Bringing Up Bates premieres on January 5th at 9 p.m. ET and season two of Growing Up McGhee premieres on January 12th at 9:30 p.m. ET. ATLANTA – December 8, 2016 – UP TV, the entertainment destination that showcases stories about modern American families and the relationships that define them, announced today that Bringing Up Bates season five will premiere Thursday, January 5 at 9 p.m. ET. Joining the Thursday night lineup on UP will be the second season of Growing Up McGhee, premiering Thursday, January 12 at 9:30 p.m. ET, following an all-new episode of Bringing Up Bates. 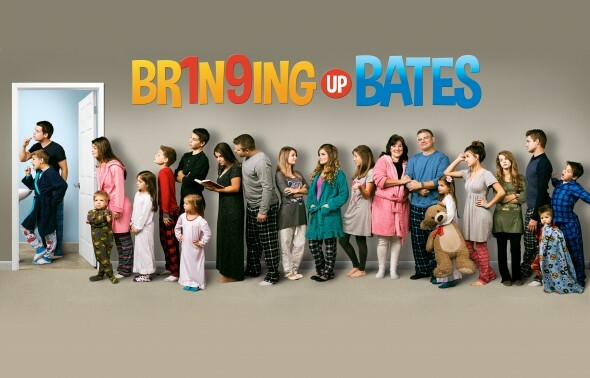 UP has ordered 15 original episodes of Bringing Up Bates and ten original episodes of Growing Up McGhee. In season five of Bringing Up Bates, it’s a time of “New Beginnings” for the family as the entire crew takes on new and exciting challenges. Zach and Whitney are adjusting to life as parents to two kids, Erin and Chad are adjusting to a new baby and a new puppy, and Lawson takes on the challenge of launching his own concert tour. Meanwhile, Alyssa has some exciting news to share that will certainly change things for her and her family, Tori sees her relationship with Bobby evolve into something more serious, and Carlin and Josie adjust to a new college and possible new careers. Also, Trace takes the necessary steps to fulfill his dream of working at the Dixie Stampede, and Gil and Kelly Jo are forging full steam ahead with their dream – building a church. It’s certainly going to be a busy year full of new surprises for the Bates. In the second season of Growing Up McGhee, with the McGhee sextuplets now six years old, their curiosity about life is making every day exciting and challenging for Ro and Mia. As they get older, each child is beginning to express their own individuality, and with that comes new interests and experiences that keep the family busy, laughing and sometimes a bit exasperated. Mia is also discovering that she is going to need to let go of the reins as the kids start socializing with friends at school and not just their siblings. From learning how to ride a bike without training wheels, going to work with Ro or learning how to play a musical instrument – all times six! – each day brings a new adventure. For Ro and Mia, the kids maturing also gives them a little more time for themselves to help them reconnect with who they were before they had kids. The season ends with an extra special event…Ro and Mia never had a wedding when they got married, so it’s the perfect time to renew their vows with their kids in tow and get that dream wedding they never had. The UP original series Bringing Up Bates and Growing Up McGhee are produced by Figure 8 Films, the acclaimed family reality television producers of such series as Kate Plus 8, Sister Wives and many others. For Bringing Up Bates, Executive Producers are Bill Hayes, Kirk Streb, Deanie Wilcher and Mary Wilcher. Executive Producer and Director is Matthew Hightower. Series Producer is Erin Shockey. For Growing Up McGhee, Executive Producers are Bill Hayes, Kirk Streb, Deanie Wilcher and Jen Stocks. Executive Producer and Director is Jessica Bertulis. Post Producer is Stefanie Valenzky. What do you think? Do you watch either UP TV series? Are you excited for new episodes? More about: Bringing Up Bates, Bringing Up Bates: canceled or renewed?, UP TV shows: canceled or renewed?